This is our brand new and portable wood kitchen microwave stand, which takes up only a littlespace but makes your life much more convenient & efficient. Made of premiumMDF and iron, this stand is sturdy and durable, lasting for lifelong use.Featuring four universal steering casters (two of them are lockable), it provides more easier mobility. 3 layer design offers large storage space and enhances the utilization of kitchen space. Don't hesitate to add it to yourcart! 【Lockable Steering Casters】Featuring four universal steering casters (two of them are lockable), it provides more flexible moving and secure parking. 【Space Saving Kitchen Microwave Stand】Perfect size for home use and only takes a little space in your kitchen, ideal for apartment or limited kitchen space. This Microwave stand makes your life convenient and efficient. 【Large Storage Space】The 2-layer shelves design offers large storage space and enhances the utilization of kitchen space. With extra top shelf and a tabletop storage space, enough to display misc stuffs, super functional. 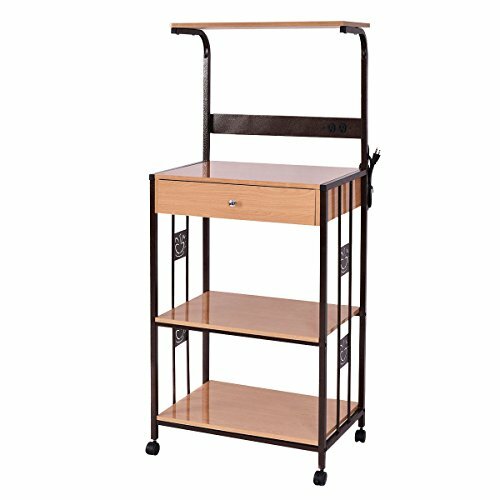 【Sturdy Reinforced Iron Frame】Made of premium MDF and customized iron main frame material, this stand is super sturdy and durable, lasting for lifelong use. 【Functional One Drawer Storage】The microwave stand has thoughtfully equipped with a drawer for closed and private storage. Your kitchen will be organized and neat.